It is not too late...there are still a few spaces left in Katie Avram's Star Bread Basket Workshop on Friday, November 4. 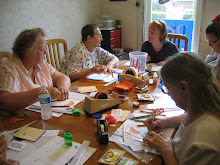 The workshop is just $35.00 and all supplies and materials are provided. Workshop begins at 10:00am and should finish at approximately 3:30pm. Call 386-454-8008 to reserve your spot and have some fun making this great basket.